Restoring a complete database is not a complicated task, but restoring a single mailbox, or a single mailbox item, is. 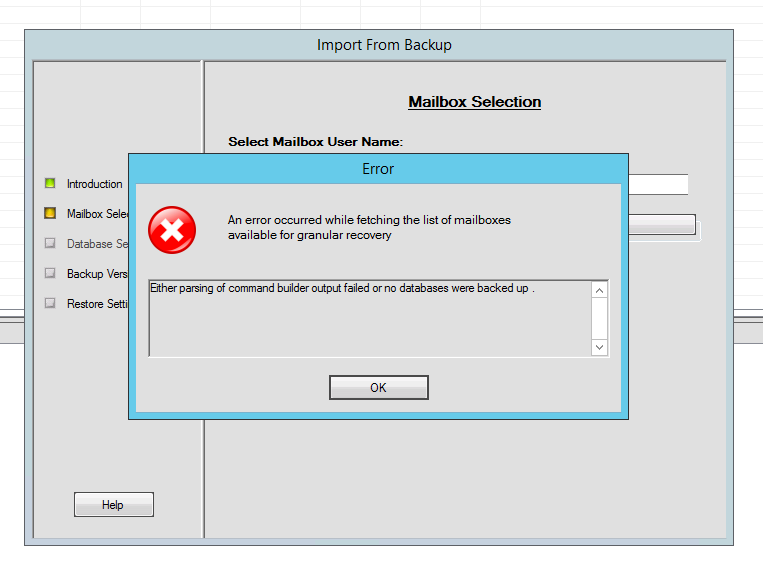 First, you need to restore the mailbox, that includes the desired mailbox, into a recovery database. Then you can restore the mailbox, or the mailbox items, from the recovery database. Some of the tasks can only be done with the Exchange Management Shell. The HPE Data Protector Granular Recovery Extension (GRE) for Microsoft Exchange helps you to simplify the necessary steps to recover a single mailbox, or mailbox items. But the GRE can only assist you during the restore. It hids the above described tasks behind a nice GUI. The backup of Microsoft Exchange is still something you have to do with HPE Data Protector. With Exchange 2013 SP1, Microsoft introduced the IP-less Database Availability Group (DAG). This type of DAG does not need a Cluster Name Object (CNO), and therefore has no IP address. With Exchange 2016, the IP-less DAG is the default DAG configuration. But how to backup a DAG, that has no IP address and no name? It is easier than imagined. You have to create a DNS A-Record that includes all IP addresses of the cluster nodes, resulting in a DNS round-robin A-Record. You also have to install the Data Protector Disk Agent and On-line Extension on all cluster nodes. After that, you simply import the DAG by using the DNS A-Record into Data Protector. Then you can proceed with the creation and configuration of a backup job, that uses the newly imported cluster. During the test phase of a new Exchange 2016 cluster, a customer of mine discovered a strange error, when he tried to restore a mailbox, or mailbox item, using the Exchange GRE. Either parsing of command builder output failed or no databases were backed up. The customer and I double-checked the installation of the GRE on both nodes. Everything was fine. We also found out, that Data Protector was able to list the backup objects. This is a shortened output of the command. As you can see, dag-backup.domain.tld is the DNS A-Record, that was created to backup the DAG with Data Protector. It took some time to get this sorted, but at the end, a new A-Record was the key. The DAG has a name, e.g. customer-dag1.domain.tld. But there is no matching A-Record, and the DAG has no IP address. When the GRE searches for available database backups, it stumbles over the mismatch between the DAG name, that is reported by the Exchange organization, and the name of the Data Protector client that was used to backup the databases. The key to success was to change the DNS A-Record from dag-backup.domain.tld to customer-dag1.domain.tld. Latter is the name of the DAG, that is given during DAG creation. After removing the Data Protector client, the re-import of the DAG with the new A-Record, and a successful backup, the customer was able to restore mailboxes and mailbox items using the GRE for Microsoft Exchange. Microsoft Exchange Server DAG configured without a Cluster Administrator Access Point is supported with Round Robin DNS mapping of DAG name to all the node IPs. Make sure that the DNS round-robin A-Record matches your DAG name. This entry was posted in Software and tagged backup, cluster, data protector, exchange, exchange 2016 on July 23, 2017 by Patrick Terlisten. 3 days ago, on 13th October 2016, HPE has released patch bundle 9,08 for Data Protector 9. A patch bundle isn’t a directly installable version, instead it’s a bundle of patches and enhancements for a specific version of Data Protector, in this case Data Protector 9. Beside fixes for discovered problems, a patch bundle includes also enhancements. There are some enhancements in this patch bundle, that have caught my attention particularly. QCCR2A64053: Support for object copy of file system data to Microsoft Azure. Data Protector now supports the creation of a special backup device, which can be used together with Data Protector object copies, to copy Data Protector file system backups to Azure Backup Vaults. This is an easy way to create copies of important data on Microsoft Azure. QCCR2A68100: VMWARE GRE stays in debug mode. I have observed this behaviour in different Data Protector installations: If debugging isn’t explicitly disabled (OB2DBG=0 in the omnirc), the VMware GRE always writes debug logs. Regardless if debugging is enabled or disabled in the GRE configuration. Because of some security related changes and fixes in Data Protector 9.08, HPE has marked this patch bundle as critical. This entry was posted in Backup and tagged backup, data protector, hpe, software on October 16, 2016 by Patrick Terlisten. |Critical| From: BMA@<hostname> "" Time: <Date><Time> |90:6111| Error retrieving encryption key. |90:6111| Error retrieving encryption key. The customer uses tape encryption. The destination for the backups is a HPE StoreOnce, and a post-backup copy creates a copy of the data on tape. Backup to disk was running fine, but the copy to tape failed immediately. The customer has opened a ticket at the HPE support and got instantly a hotfix to resolve this issue. HPE has documented this error in QCCR2A69192. If you run into the same issue, please request hotfix QCCR2A69802. This hotfix consolidates QCCR2A69192 and QCCR2A69318 (The BMA ends abnormally during backup/copy to tape). Thanks to Stefan for the hint! This entry was posted in Backup and tagged backup, bug, data protector, hpe on September 4, 2016 by Patrick Terlisten. will be phased out. The self-help support will be continued until June 30, 2018. Self-help includes access to the knowledge base, current patches and access to known problems. Data Protector 8.1x will be under support until June 30, 2017. The self-help support for Data Protector 8.1x will be continued until June 30, 2019. Please note, that you need new license keys if you want to update Data Protector 7.0x or 8.0x to Data Protector 9. To gain new license keys, you need an active support contract. If you have valid Data Protector 8.1 license keys, you don’t need new license keys. Don’t hesitate to leave a comment if you need further information. This entry was posted in Backup and tagged backup, data protector, hp, hpe on May 7, 2016 by Patrick Terlisten. The hotfix solved the issue. And to be honest: I didn’t care why it has worked after applying the hotfix. I had the same issue at multiple customers and applying the hotfix solved the issue in each case. There was a footnote for VDDK 6.0 U1. The VM backups does not use SAN transport mode on vSphere 5.1, 5.5 (and its updates) environment and falls back to NBDSSL/NBD. This is because of VDDK 6.0 U1 issue. For more information, see VMware Knowledge Base. Virtual Disk Development Kit 6.0 Update 1 backup and restore commands fail using SAN transport mode on ESXi 5.5.x hosts. This issue occurs on both Windows and Linux proxies. 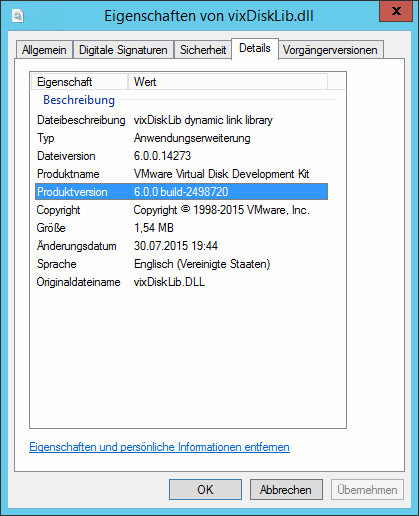 The vixDiskLib.dll had the build version 6.0.0 build-2498720, which is the build version of the Virtual Disk Development Kit 6.0. So it seems, that the Data Protector hotfix QCIM2A65619 makes a downgrade of the VDDK that is used by Data Protector. KB2135621 describes, that this issue is resolved in in VMware vCenter Server 6.0 Update 2. This also implies, that this is fixed for VDDK 6.0 U2 and therefore Data Protector 9.06. I’m sorry Data Protector. It was not your fault! This entry was posted in Backup and tagged backup, data protector, hp, virtualization, vmware on April 24, 2016 by Patrick Terlisten. The Virtual Environment Integration (VE Integration) provides protection of VMs in virtual server environments. It is used o integrate HPE Data Protector with various virtualization environments, currently VMware vSphere and Microsoft Hyper-V. For Citrix XenServer is a script solution available. 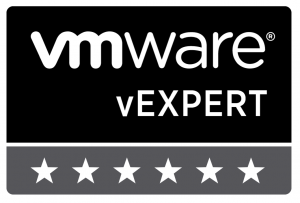 I will focus on VMware vSphere. I took this table from the “HPE Data Protector 9.00 Integration Guide for Virtualization”. As you can see, Data Protector offers all you need to create a crash-consistent backup of your VMs. HPE Data Protector relies on the VMware vSphere Storage APIs – Data Protection (formerly known as VMware vStorage APIs for Data Protection or VADP). Data Protector has to use the same API as Veeam, CommVault Simpana or any other product that can be used to backup VMs in a VMware vSphere environment. Therefore, most software products offer the same features. After finishing the backup of the VM, the snapshot is released and the VM is unlocked. I took this picture from the “HPE Data Protector 9.00 Integration Guide for Virtualization” to illustrate the data flow and what components interact with each other. Without CBT, Data Protector uses snapshots to identify changes on file level. With CBT, Data Protector identifies changes on block level. With CBT, the number of snapshots remaining after a backup is always 0. Without CBT, Data Protector keeps up to 2 snapshots (mixed snapshot handling). You must not delete these snapshots. Otherwise a full backup of a VM is necessary to create a new, valid backup chain. Even if CBT is enabled, Data Protector requests the creation of a snapshot to get a consistent state of the VM. Because of this, a VM backup requires sufficient free disk space on the datastore where the VMDKs of the VM reside. The longer a backup takes, and the more changes are made, the bigger the snapshot gets. Here comes the free space required option into play. You can specify the amount of free disk space, that must be available at the start of the backup, e.g. 10% or 20%. The required free space is calculated based on the size of VMDKs of a VM just before the snapshot is created. Data Protector checks all datastores where the virtual machine disks reside. If a VM has a 100 GB VMDK and you set the free space required option to 10%, at least 10 GB free disk space is required in each datastore, where the VM has VMDKs located. The check is per VM! to the omnirc on the VEAgent backup host. By default, a maximum of 10 concurrent threads are executed when backing up VMs using the VEAgent integration. This os good for the backup performance, but it also places load on the infrastructure. You can change this by adding the OB2_VEAGENT_VCENTER_CONNECTION_LIMIT variable to the omnirc on the VEAgent backup host. I had several cases where VEAgent backups failed because the VEAgent (vepa_bar.exe) or the Backup Media Agent (bma.exe) failed with a memory dump during the backup, or during the initial environment discovery. In all cases, the VEAgent, the MA and the CM were located on a single physical host. This is highly not recommended according to the Data Protector Support. 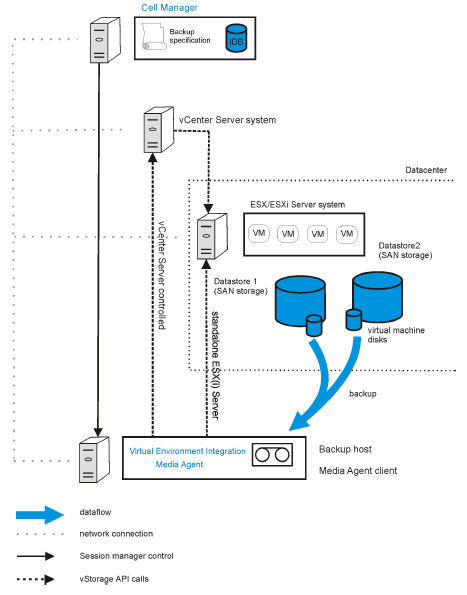 A possible solution is to deploy a Windows Server VM and push the VEAgent onto it. You can use this VM as VEAgent backup host, and the physical host acts only as MA and CM. With the OB2_VEAGENT_BACKUP_DISK_BUFFER_SIZE option, you can modify the buffer size used during the backup. The SAN and the HotAdd transport mode support disk buffer sizes from 1 MB to 256 MB. By default, they use 8 MB disk buffers. The NBD and NBDSSL transport are always using 1 MB. Using bigger disk buffer sizes can improve the backup performance, but it also increases the memory consumption. On Windows VMs it is possible to use Volume Shadow Copy Service (VSS) to quiesce the states of the applications running within a virtual machine before a snapshot is created. A ZIP archive is created that contains all the BCD and writer manifests. Please note that quiescence can slow down the performance of a backup sessions considerably. During my last projects, I collected a number of common or best practices. I provide this “AS IS” with no warranties! Thanks to the HPE Data Protector support team for helping me during several support cases. Special thanks to Dimitar, Jose, Zhulien and Stephen! You should use jobs with a maximum of 30 VMs. Try to keep the size of a backup equal, but don’t add more than 30 VMs into a single job. 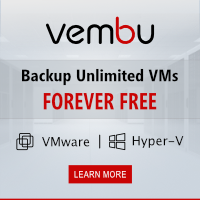 If a job fails, you have to restart the job for 30 VMs, not for 200 or more VMs. With more jobs, you can execute jobs in parallel. You shouldn’t combine CM, MA and VEAgent on a single physical or virtual server. Try to separate at least the VEAgent backup host. You can use a VM for this. Use OB2_VEAGENT_THREADED_BACKUP, or OB2_VEAGENT_VCENTER_CONNECTION_LIMIT, and/ or reduce the number of running MAs. Whenever possible, use CBT instead of single or mixed snapshot handling. Whenever possible, use SAN transport. If you can utilize SAN transport, try to use a virtual VEAgent backup host. In this case Data Protector will use HotAdd transport mode. This entry was posted in Backup and tagged backup, data protector, hp, storeonce, vmware on April 17, 2016 by Patrick Terlisten. [Minor] From: OB2BAR_E2010_BAR@exchangeserver.domain.tld "MS Exchange 2010+ Server" Time: 21.03.2016 20:00:27 [170:313] One or more copies of database DATABASE are already being backed up in a different session. [170:313] One or more copies of database DATABASE are already being backed up in a different session. Interestingly, there was no other backup session running. But the night before, the backup jobs failed because of a network failure. This command will free up the locked resources in the Data Protector database.Then, run the job again. This entry was posted in Backup and tagged backup, data protector, exchange, hp, troubleshooting on March 21, 2016 by Patrick Terlisten. HPE Data Protector stores multiple backup objects on a single Catalyst store item. A backup object can be a volume, a mount point, a database or a virtual machine. You can have multiple backup objects per backup client. If your filesystem backup job has four backup clients, and each client has two volumes, the backup job will contain 8 backup objects. Another example is a single database of a Microsoft SQL or Oracle database server (instance). A Catalyst store item is an object of a StoreOnce Catalyst store and stores the data of a specific backup job. If you backup multiple VMs in a single VE Integration job, the Catalyst store item will include all VMs from that specific job. Or if you backup an Exchange server with three databases, the Catalyst store item is used to store these three databases. Due to this behavior, a single Catalyst store item can reach enormous sizes. Usually this is not a problem. But if you have to copy backup objects to other media (e.g. tape), Data Protector has to read the store medium for each backup object. As the name says: The copy operation in Data Protector is based on backup objects. If there are multiple backup objects on a Catalyst store item, a backup object copy can take some time. Since HPE Data Protector 8.1, Data Protector offers an option to store a single backup object per Catalyst store item. 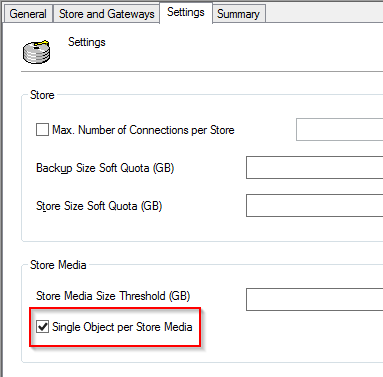 You can enable this option in the properties of a StoreOnce D2D device (“Settings” tab). A possible disadvantage is the increasing number of Catalyst store items, especially if you have a large number of backup clients with many small backup objects. HPE Data Protector and StoreOnce have a limit with regard to the maximum number of Catalyst store items (which isn’t publicly documented …). This entry was posted in Backup and tagged backup, data protector, hp, storeonce on March 1, 2016 by Patrick Terlisten. This posting is ~4 years years old. You should keep this in mind. IT is a short living business. This information might be outdated. After installing the Data Protector patch bundle 8.13, you may ran into this error when trying to restore data from a HP StoreOnce appliance. STARTING Media Agent "D2D_GW1 [GW 6408:0:7255964966039732580]"
ABORTED Media Agent "D2D_GW1 [GW 6408:0:7255964966039732580]"
This problem is known and it is described in QCCR2A56465. A fix is available (new BMA, CMA, MMA and RMA binaries). Simply open a service request and ask for the fix. Make sure that you add a copy of the session messages or a screenshot to the service request. This entry was posted in Backup and tagged backup, bug, data protector, hp on December 4, 2014 by Patrick Terlisten. This applies to upgrades from Data Protector 6.x and 7.x to 8.x and 9.x. It seems that today is my debugging day… Yesterday I performed a Data Protector update from 7.03 to 8.13. During this update, the Data Protector IDB is migrated to another database format. Last night the backups went smoothly, but today I noticed that two old Detail Catalog Binary File (DCBF) directories were still referenced in the HP Data Protector IDB. C:\Users\Administrator>omnidbutil -list_dcdirs Configured DC directories: Allocation Sequence | Maximum Usage in MB | | Maximum Number of Files in Directory | | | Minimum Free Space [MB] | | | | Directory | | | | | =========================================================================== 2 16384 10000 2048 <strong>C:/ProgramData/OmniBack/db40/dcbf</strong> 0 204800 100000 2048 C:/ProgramData/OmniBack/server/db80/dcbf/dcbf0 1 16384 10000 100 <strong>D:/OmniBack/db40/dcbf</strong> 1 204800 100000 2048 C:/ProgramData/OmniBack/server/db80/dcbf/dcbf1 4 204800 100000 2048 C:/ProgramData/OmniBack/server/db80/dcbf/dcbf4 3 204800 100000 2048 C:/ProgramData/OmniBack/server/db80/dcbf/dcbf3 2 204800 100000 2048 C:/ProgramData/OmniBack/server/db80/dcbf/dcbf2 DONE! A quick check after the relocation showed no errors. C:\Users\Administrator>omnidbcheck -bf Medium ID: Actual Size Header Size Check ======================================================================== 6d50d6a3:54777b65:09d0:6604 809828 809828 OK 6d50d6a3:5479522c:09d0:6b4f 163080 163080 OK <SNIP> 01401eac:547d2251:0bbc:01ec 6008832 6008832 OK 01401eac:547d21e9:0bbc:01e9 311296 311296 OK 01401eac:547d22d4:0bbc:01ef 2600960 2600960 OK 01401eac:547d2411:0bbc:01f2 2883584 2883584 OK 01401eac:547d24e2:0bbc:01f5 1929216 1929216 OK 01401eac:547d25bc:0bbc:01f8 2146304 2146304 OK 01401eac:547d266e:0bbc:01fb 7098368 7098368 OK 01401eac:547d2790:0bbc:01fe 2015232 2015232 OK Check has finished : 0 errors reported DONE! Did I mentioned that today was my debugging day? To make a long story short: HP switched the path separator character for the Data Protector IDB. They are using now a / instead a \ on both platforms (Windows & UNIX). During the update, this change is not performed correctly. Sebastian Koehler wrote a small SQL script that fixes this problem. Check his blog post (he had the same problem as me). This is the output of the script when I run it. C:\Users\Administrator>omnidbutil -run_script D:\TMP\dcbf_dir_fix.sql -detail dcbf_directory ------------------------------------------------ C:/ProgramData/OmniBack/server/db80/dcbf/dcbf1 C:/ProgramData/OmniBack/server/db80/dcbf/dcbf4 C:/ProgramData/OmniBack/server/db80/dcbf/dcbf0 C:\ProgramData\OmniBack\db40\dcbf D:\OmniBack\db40\dcbf C:/ProgramData/OmniBack/server/db80/dcbf/dcbf3 C:/ProgramData/OmniBack/server/db80/dcbf/dcbf2 (7 rows) UPDATE 7 UPDATE 7 dcbf_directory ------------------------------------------------ C:/ProgramData/OmniBack/server/db80/dcbf/dcbf1 C:/ProgramData/OmniBack/server/db80/dcbf/dcbf4 C:/ProgramData/OmniBack/server/db80/dcbf/dcbf0 C:/ProgramData/OmniBack/db40/dcbf D:/OmniBack/db40/dcbf C:/ProgramData/OmniBack/server/db80/dcbf/dcbf3 C:/ProgramData/OmniBack/server/db80/dcbf/dcbf2 (7 rows) DONE! You can clearly see that the wrong path separator is used for the old DB40 directories (the upper part of the output). Compare it to the output of omnidbutil -list_dcdirs! The lower part shows that the correct path separator was set. After the run of the script I was able to delete the old DCBF directories. C:\Users\Administrator>omnidbutil -remove_dcdir D:/OmniBack/db40/dcbf DONE! C:\Users\Administrator>omnidbutil -remove_dcdir C:/ProgramData/OmniBack/db40/dcbf DONE! Thanks to Sebastian, who described this bug. This entry was posted in Backup and tagged backup, bug, data protector, hp on December 2, 2014 by Patrick Terlisten.